Large images, emotive video and feature-length text have become hallmarks in a new wave of media-rich, long-form storytelling from news organisations and the wider web. The approach to digital storytelling has been both the subject of industry awards as well as ongoing debate as to the merits of the medium, but news outlets continue to create them apace, as highlighted by this public Google doc created by Matter's Bobbie Johnson. 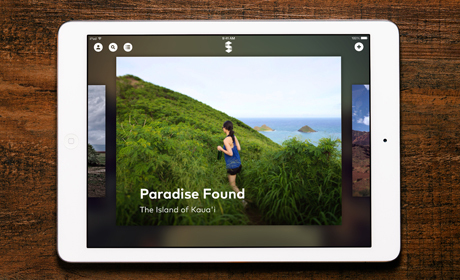 Storehouse, a free app currently exclusive to iPad that launched last week, is looking to democratise that process, joining platforms with similar endeavours such as ScrollKit and Shorthand, which is yet to be launched as a public tool. "A lot of the more long-form creation tools are really designed for people that are really technical in nature," says Mark Kawano, chief-executive and founder of Storehouse, told Journalism.co.uk. "So they either know how to code or they need to be really well versed in graphic design and know how all the page layout programs work, those storytelling platforms that utilise multiple photos or videos. That was a big bottleneck." 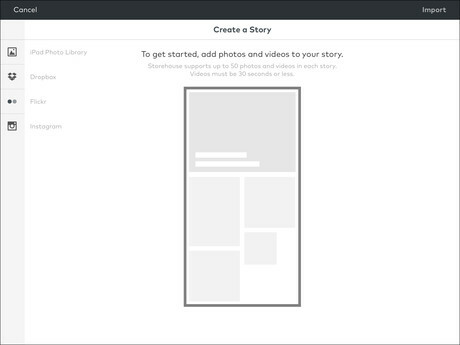 With Storehouse he aims to make the process of visual storytelling more intuitive to those who may not have any technical training but have the content and media that can be used to tell stories. Users can link their Flickr, Instagram and DropBox accounts, as well as any iCloud or camera roll media, to import photos or video into a story. Videos are limited to 30 seconds and play on a constant loop, like a Vine or GIF file with audio, while each article can hold up to 50 media objects. From there, images can be moved around, pinched, cropped and placed to tell the story in a "true WYSIWYG [what you see is what you get] editing sense", said Kawano – an ex-Adobe and Apple product designer involved in developing products for Photoshop and Apple's iPhoto, among others – before users publish publicly. "We use the metaphor that it's a lot closer to just pouring out a box of photos onto a table and rearranging them that way," he said, "than it is the traditional desktop creation workflow where you always have an idea of what's in your head and trying to make the software do that rather than a more physical process." 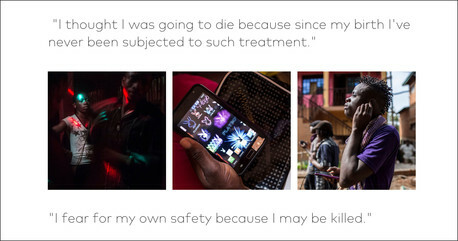 Some examples of stories created so far include a snapshot into the gay community of the Democratic Republic of Congo by Czech photojournalist Jana Asenbrennerova; "Travels in the Scottish Hebrides" by the National Geographic's Jim Richardson; a recipe for gravlax by Lauren Jong; and many other stories, accounts and galleries by professionals and amateurs. The similarities with the ongoing trend of visually immersive stories from news organisations is not lost on Kawano, and although he said the project started around a year ago – "when a lot of these projects were coming" – the thinking behind the project was more conceptual in terms of a "lean-back or interactive" experience, rather than derivative of any particular project. "It's very different from that once a week piece [from news outlets] or something that you see every so often on the internet," he said. "This needed to be pretty conservative when it comes to parallax or animation because we wanted to have the user focus on content not necessarily those interactive elements." In this sense he sees Storehouse as a "very clean consumption experience" that is accessible to readers who may be "looking at hundreds or maybe thousands" of these media-rich articles around the web. At present all Storehouse stories are published publicly to the in-app gallery or a Storehouse URL, leading to "a lot of different requests" from news organisations, universities and commercial companies around the world looking to use the platform internally. "Right now our focus is this more public tool where everything that gets published is available live," he said, adding that a business model is currently not the focus. "We have a lot of stuff planned in the future and we're learning about that but we knew that from the get-go we wanted to make sure that this was available to anybody that wanted to publish. "We didn't want to perpetuate the old model where really high quality distribution and creation tools were just in the hand of specific organisations or companies. We wanted it to be available to any individual person as well."